You are invited to come to this event next Wednesday at Las Huertas! 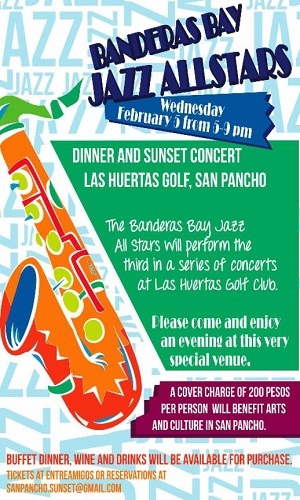 The Banderas Bay Jazz Allstars will perform at this benefit for the work being done by arts and cultural groups in San Pancho (including EntreAmigos, Colectivo San Pancho, Bodega Teatro and Allianza Jaguar). Tickets on sale at EntreAmigos, or email me! by clicking here)You can put your name on a reservation list at the EntreAmigos front desk – consider reserving soon because seating is limited for this special show! Gracias a Chas (and the Allstars! ), Joe Hadlock and the folks at Las Huertas Golf! See you Wednesday at sunset!